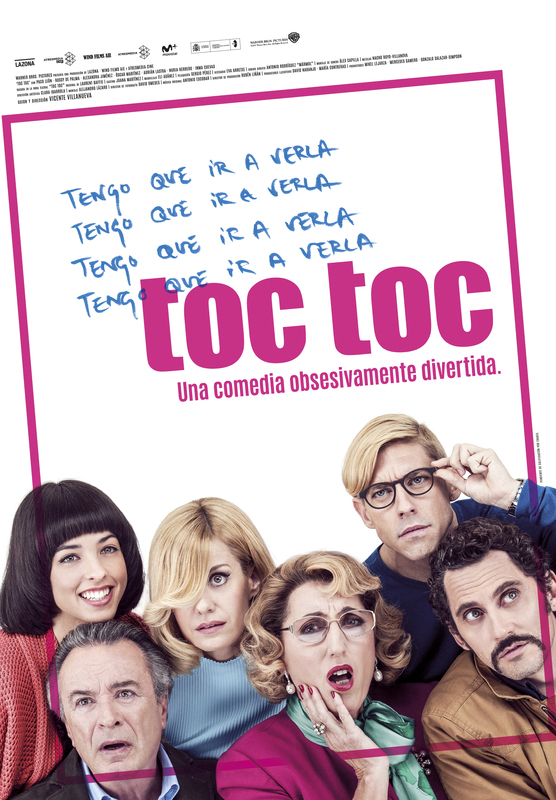 A seriously funny movie that avoids making fun of its characters by painting their various plights with sympathy and understanding, Toc Toc is an adaptation of the stage play by Laurent Baffie. It’s sensitively handled, and takes its time in establishing each character’s problem and how they attempt to deal with it. It’s these defensive mechanisms that the script (by Villanueva) exploits in the beginning, and a great deal of the early humour is in seeing how much more difficult these defence mechanisms make their individual lives. Bianca cleans the lab where she works which raises the ire of the cleaning staff. Ana Maria crosses herself every time she hears a profanity, which is tiringly often. Otto can’t maintain a relationship if his partner is deliberately and unthinkingly messy. As each character explains just how their obsessions can have a negative effect on their lives, each illustration is conveyed in a humorous and yet melancholy way that allows the movie to be both necessarily exploitative but also sincere and mindful. It’s a delicate balancing act, but thanks to Villanueva’s assured direction and the unwavering commitment of the cast, these characters are never less than treated kindly, and with a great deal of compassion. This allows the interaction between them – though still imbued with a staginess that can’t be avoided – to flourish in rich and rewarding ways. There’s a budding romance between Otto and Lili that is as sweet and unassuming as you could hope for, and Ana Maria’s initial reluctance to admit she’s a patient reveals a resourcefulness that proves to be a benefit to the whole group. These and other aspects are carefully drawn out by Villanueva and the cast, and even though there are farcical elements that are enacted with undisguised glee, the underlying seriousness of the situation isn’t ignored, making this often beautifully observed and trenchant at the same time. All the cast are on good form, with León’s garrulous, jokey cab driver and de Palma’s uptight religious hausfrau particularly enjoyable to watch, and Villanueva maintains a light, frothy tone that’s supported by a whimsical score by Antonio Escobar, and David Omedes’ fluid cinematography. Even the most casual of viewers will be able to work out where all this is heading, but it’s how it gets there that’s very much part of the fun. Rating: 8/10 – some staginess and predictability aside, Toc Toc is a delightfully engaging meringue of a movie that knows exactly what it’s doing, and does it very well indeed; good-natured and agreeable, it’s the kind of movie that, like many other foreign language movies, deserves a wider audience than it will most likely attract. NOTE: Sadly, there’s no subtitled trailer for Toc Toc currently available.